speed index – a measure how quickly a page becomes visually complete (read more about how we work this out). Tests in Performance Analyzer are carefully controlled to deliver consistent, repeatable results, but in an effort to filter out any outliers, we test each page three times a day and take the median of each metric. This gives us an extremely reliable view of how each page performs from the end user’s perspective. At the time of writing, the results show that most of the organizations we tested have some way to go to improve user experiences. 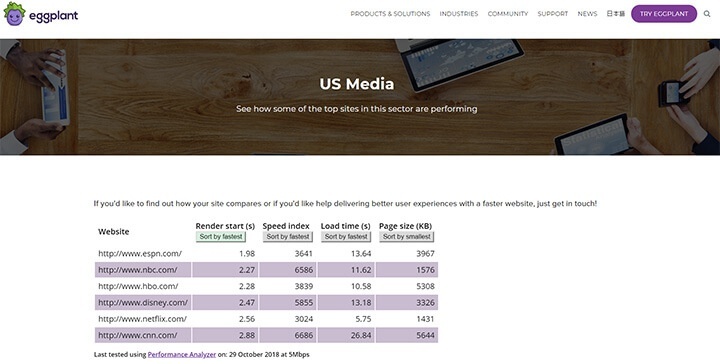 While a handful of sites manage impressive render start times of under a second, most are lagging a long way behind, and it’s not uncommon for sites to take four or five seconds to start displaying content. Similarly, overall load times can be as long as 15 to 20 seconds, well over the recommended three seconds. Want to see how well your own site performs? If you’d like to find out how your site measures up to around 700 of some of the world’s most popular, now you can! Just head to https://eggplant.io/test-your-website, enter a URL and see what Performance Analyzer has to say. Note that the output is different from what you would see as a regular user of Performance Analyzer – instead, we bring you the highlights, including a comparison to show how you measure up against our selection of other top websites. Both this and the Digital Experience Index draw on the power of the Performance Analyzer API to pull out raw test data and present it in new ways. The API is available to all Performance Analyzer users, and can be particularly helpful when it comes to creating custom dashboards or building Performance Analyzer tests into the release process. Find out more about Performance Analyzer.